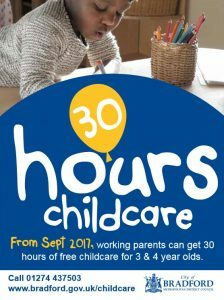 Many working parents of 3 to 4 year olds in England will be eligible for 30 hours of free childcare. But the first thing you need to know is that this is 30 hours free for only 38 weeks per year – not 52 weeks of the year. It’s basically equivalent to school term times so fits in perfectly with Ghyll Royd Pre-School and Nursery. Not everyone is eligible. But everyone will still receive the 15 hours free childcare that is currently available. How does the Early Years Funding work at Ghyll Royd? Ghyll Royd Pre-School and Nursery offers 15 and 30 hours free childcare options. An outline of fees and sessions costs can be found on our Pre-School Registration and Fees page. There is a daily charge of £18 outside of the funded hours. This is exclusive of the Early Years funding and provides snacks, wipes, lunchtime cover, and costs towards some additional activities. Our funded sessions are three hours in the morning or three hours in the afternoon. Upon availability, certain Before and After School Club sessions can be offered as part of the Government funded childcare scheme. In the news 22.03.2017 : the government has today published eligibility criteria for parents interested in the 30 hour offer, as well as their new website ‘Childcare Choices’ which aims to help parents understand what support is available for their childcare needs, including information on Tax Free Childcare and the 30 hour offer. “While any help for families struggling with the cost of childcare is to be welcomed, we remain concerned that the tax-free childcare scheme will be of limited help to those most in need. Not only it is a regressive initiative – the more money you can afford to save, the more help you get from government – but it also fails to address the root cause of rising childcare costs: insufficient funding. The government continues to claim that tax-free childcare and the 30-hour offer will save parents in England thousands of pounds each year, but without adequate investment into the early years sector, what we are actually likely to see is a rise in childcare fees as some providers look for ways to plug the growing funding gap, and a loss in places as others opt out of the free entitlement due to insufficient funding.